So much more than tea…and it’s organic! Our friends at the Wholesome Tea Company, the genius brand behind Inko’s and Blue Buddha Tea and Energy Drinks, have a collection of organic drinks to help keep you hydrated, healthy and happy. The base for Inko’s is white tea, a healthy tea loaded with antioxidants and polyphenols. They offer a wide variety of delicious flavors like white peach, peak summer apricot, and vine ripe honeydew, as well as 3 unsweetened options (hint o-mint, southern honeysuckle, and pinch o’ginger), plus an energy drink in citrus, mango, and blackberry. Let’s talk about the Energy Drinks – these are delicious and refreshing after a workout and you won’t have any problems with jitteriness. For a large can, 16.5 ounces, there are only 100 calories, so compared to lots of energy drinks out there, you’ve got about half the sugar and calories, and it’s organic! They’ve added organic tea caffeine, organic American ginseng, and organic guarana, so be sure to give it a little shake to get all the benefits in every sip. The Blue Buddha Organic Wellness Tea is an interesting drink which is aimed at improving your focus, mental stamina, immunity and vitality, thanks to special ingredients like Ashwagandha, Maitake Mushroom, and Indian Gooseberry. Remember to shake before drinking to ensure you get all the goodness. Choose from 4 flavors: Raspberry Hibiscus, Lemon Elderflower, Blueberry Rose, and Cherry Lavender. These are a great alternative to coffee in the morning or as a mid-afternoon pick-me-up and have only 40 calories! 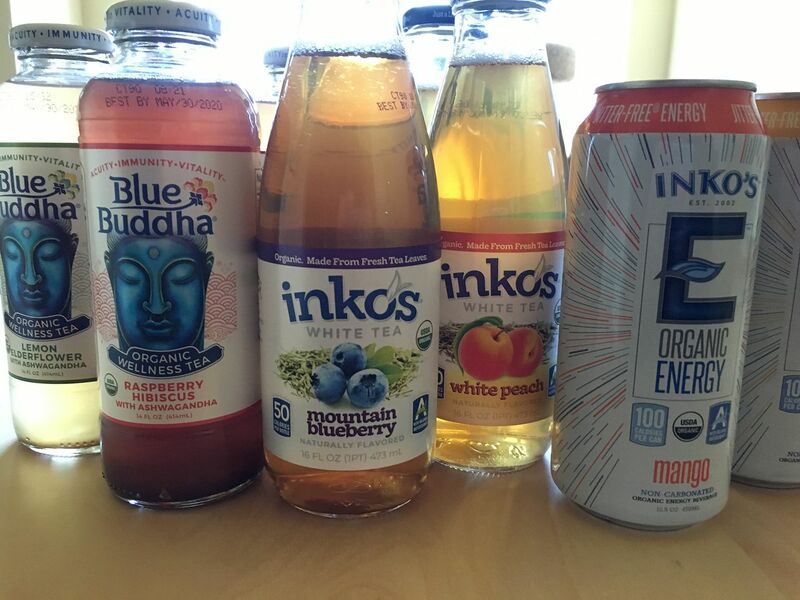 Organically quench your thirst and more with Inko’s and Blue Buddha Teas and Energy Drinks!